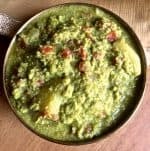 If you have been following this blog, you will remember that I am member of the Shhhhh Cooking Secretly Challenge Group on FB, and that over the last few months, we have plunged into a State by State sampling of Indian cuisine. The theme for this Jan 2018 was Chhattisgarh cuisine, and my lovely partner for the month, Priya Iyer, gave me as the secret ingredients, basen (chickpea flour) and jeera (cumin) seeds. 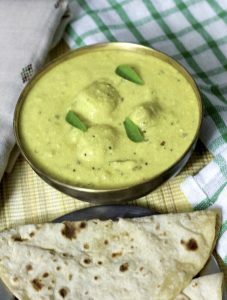 When I posted the image of the Arbi ki Kadhi I had made, the cumin was easily guessed, though for some odd reason, my friends on the group did not identify the chickpea flour, which I had thought they would easily do. It was fun, watching each of the group members trying to guess which 2 ingredients were the ‘secret’ ones used in the recipe. About Priya Iyer, who was my partner for Jan 2018. Priya blogs as The Girl Next Door, and I love to browse through her recipes and her snippets on travel and her restaurant reviews. Do check the blog for her Chattisgarhi recipe. 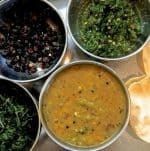 Her secret ingredients were gram flour (channa dal) and onion, and she made good use of them in her delicious looking Dal Bafauri – a Zero Oil recipe! 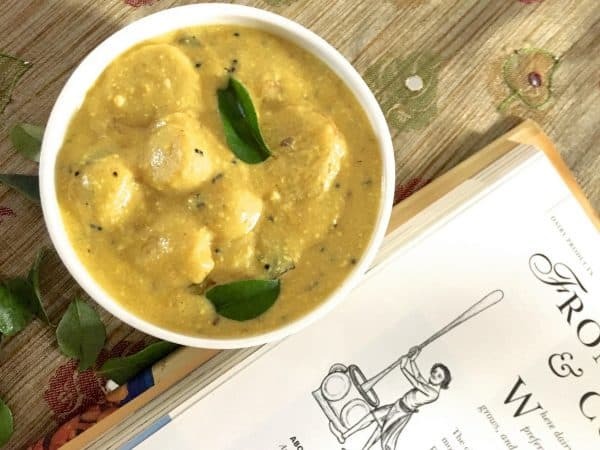 The version of Arbi ki kadhi made in South India, specifically in Tamil Nadu where I am from, has a coconut paste instead of the basen (chickpea flour) used in the Northern Indian versions, otherwise there is not much difference in the preparation. 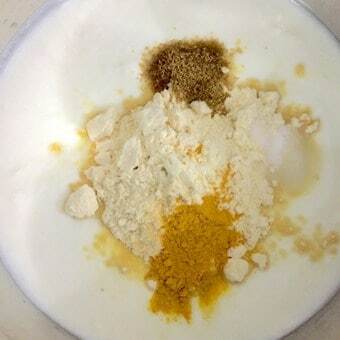 As usual, in making kadhi, it is best to keep the pan of yogurt cooking on a low flame, with frequent mild whipping to keep the curds and whey together instead of splitting, as they tend to do when yogurt is subjected to heat. I have not fried the arbi but have only boiled and them, as I understand was the traditional (and healthier) way. Serve the Arbi ki kadhi hot with basmati rice (and ghee), as kadhi chaval, or with chapatis. 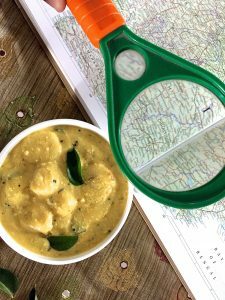 Traditional Arbi ki Kadhi, this simple curry of colocasia in yogurt gravy from Chattisgarh cuisine, is a delicious treat with hot rice and ghee or with roti. 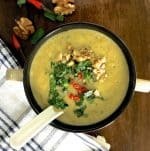 Easy to make and has very little oil or spice and is yet so tasty! Wash the arbi well to remove any grits or mud. Drain and pressure cook in water to cover it, for 3 whistles and then remove from the stove. 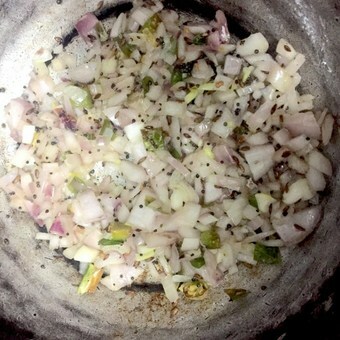 When the cooker is ready, drain and peel the arbi. Slice into narrow rounds. Set aside till required. Meanwhile, while the arbi cooks, beat the curd and add to it the chickpea flour (basen), turmeric, cumin powder and salt. Whisk till smooth. If the curd is thick and you prefer it thinner, add a little water (2-3 tablespoons) and whisk it well. Set aside till required. Slice the onions small. Slice the green chillies. I usually mince the curry leaves too, so they get eaten instead of the nutritious leaves being discarded on the plate. Heat a pan and add oil (or ghee, as preferred). 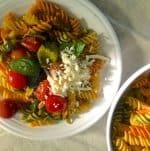 I used sunflower oil, but any vegetable oil would suit. 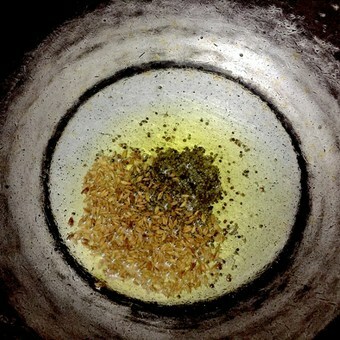 When the oil is hot, add mustard seeds, let them crackle. 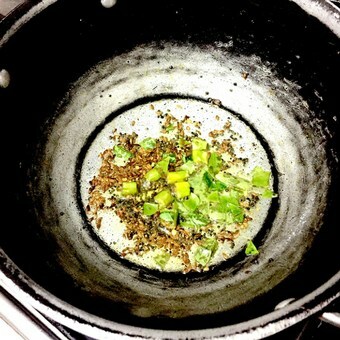 Add cumin seeds, keeping the stove on low heat. Continuing to keep the heat low, add green chillies and let them sputter. Add curry leaves - Fresh curry leaves usually sputter and crackle when added to hot oil, so step away as you do when chilies are added. Add the slices of onion and sauté till the onions are translucent, stirring occasionally so they do not catch at the bottom of the pan. 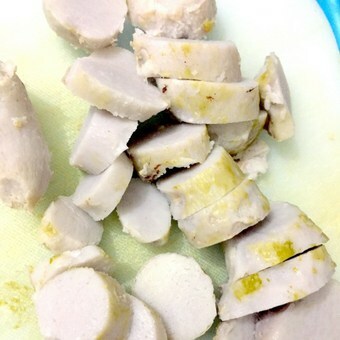 Add the slices of peeled arbi (colocasia). Add the red chilli powder. 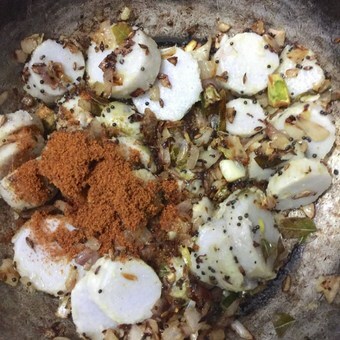 Sauté for about 3-4 minutes in the spices already in the pan, stirring briskly so that the arbi is coated with the spices. The arbi is already boiled, so it does not need to cook for long, however let the raw smell of the chilli dissipate. Keeping the stove on low heat, add the curd you have kept ready with flour, turmeric, cumin powder and salt. Whisk it again and if thick, add a tablespoon of water. Bring to a slow boil. Keep it on a simmer for 5 minutes till the raw smell of the flour goes away, and then remove the pan from the stove. Transfer the arbi ki kadhi immediately from the hot pot to a serving vessel and serve with rice or with chapatis. Delicious and tasty kadhi with my favourite root vegetable……. It was very nice with hot rice and ghee, Sharanya! Thank you! Arbi ki kadhi looks completely different we south Indians makes a similar dish with arbi. Fingerlicking gravy. Morekuzhambu with arbi! I love that too! Morekuzhambu, right? I love that version too! 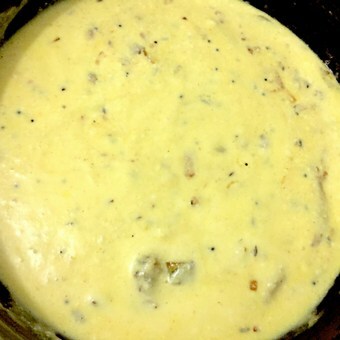 Lovely recipe … I substituted arbi with gatte … Was yummy ! Thanks for trying it out. Gatte sounds a lovely substitute for arbi! Thank you for the sweet little introduction to my blog! Thank you, Priya! 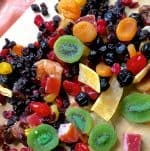 These theme based recipes are so interesting to make! The kadhi looks delicious and loved the addition of arbi. I love arbi and this is making me drool. Thanks, Priya. It was tasty and easy to make too! It was difficult to guess the ingredients. Lovely delicious looking kadhi. Bookmarked. The arbi kadhi looks delicious. In Sindhi cuisine we cook it with caramelized onion gravy. Must give it a try. Caramelised onion gravy! That must be very tasty too! Arbi ki Kadhi looks so inviting di ..flavorful and comforting too ! This kadhi looks absolutely delicious. I love Arbi in any form and this reminds me of our Mor Kozhumbu with the only exception that it has coconut gravy for thickness. Would definitely try this kadhi which is simple and more apt for everyday cooking. Great theme and lovely post.